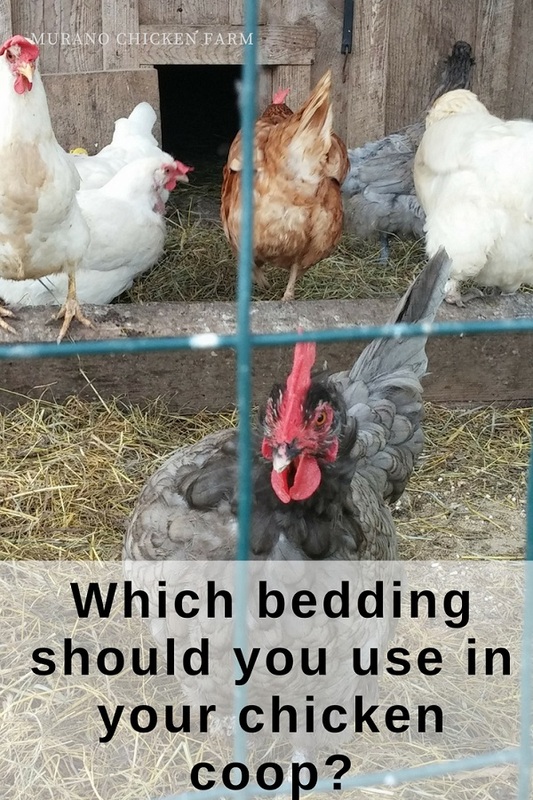 Which chicken bedding should you use? When it comes to the stuff laying on the floor of your chicken coop you would think that it doesn't matter all that much. Trust me, it does. Choosing a chicken coop bedding can depend a lot on your particular situation. Throughout the years I have tried: wood shavings, sand, dry leaves, dry grass, straw, hay and shredder paper in my chicken coops. They do not all perform the same way! When choosing a chicken coop bedding you'll need to consider the size of your coop, weather, coop placement and your chicken population. A large coop could be expensive to fill with wood shavings or sand, even more expensive of it's packed with chickens and the bedding needs changed regularly. Plus, not every material works in every climate. For example, a few years back sand had a sudden surge in popularity as coop bedding among chicken keepers. Unfortunately if you have a coop and covered run in a shady area like I do, sand does not stay dry. In fact, once it's wet it pretty much never dries out. Wet sand sitting on the coop floor and against the walls of the run causes wood to mold and rot. Now I know people who use sand and it works great for them, but their coops are in sunnier locations so the sand stays dry. It did not work well for me though and that coop was completely destroyed from wood rot. Using straw as coop bedding. Using shredded newspaper as coop bedding. Summary: Free bedding source, absorbs well, blows all over the yard, mixes well with other bedding materials, composts well and works with the deep litter method. Using dry leaves as coop bedding. Summary: Free bedding source, not super absorbent but it does the job, great for dry coops, bugs hide in them which chickens love, very light to clean out, mixes well with other bedding materials, composts quickly and works with the deep litter method. This is by far my favorite coop bedding! You can buy wood shavings packed into bale style bags at feed stores or get them by the truckload from a lumber mill. The wood mill near me charges just a few dollars to fill my pickup truck. Wood shavings are absorbent, easy to clean out and work very well with the deep litter method. When using the deep litter method, you will only be cleaning out your coop once a year. However, if you don't use deep litter and can only get shavings from the feed store then wood shavings might be a bit expensive. I have made the mistake of using hay and let me tell you, I won't be doing that again! Hay still has seeds in it. Lots of them. I had thought that the chickens would eat all the seeds, I was wrong. Almost all of our bedding ends up in the compost pile and eventually gets used in the garden. Now granted some of the leftover seeds get killed off in the heating process that compost goes through but trust me when I say that many of the seeds survive! I had hay grass popping up left and right in the garden, along the edges of the woods and outside the coop and run. 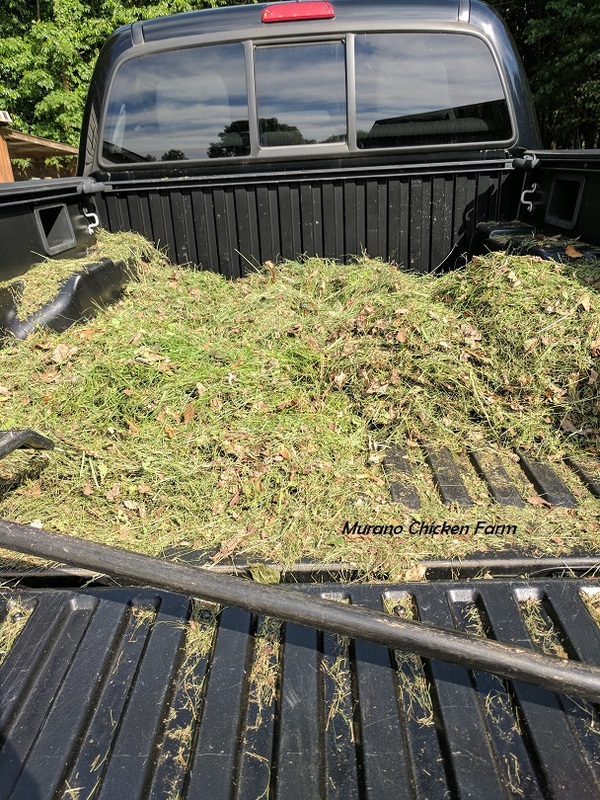 Even though farmers will often discount hay if it gets dusty or wet (it's no longer good for animal feed but is just fine for bedding) I would skip it if you plan on using your coop bedding to make compost. If however, you don't compost then go ahead and get the hay but remember you will have it sprouting where ever it may land. Be very careful that your hay is dry though. If hay is damp, mold can grow and cause illness in your chickens. Hay also breaks down well with the deep litter method. Grass clippings from the lawnmower can be used as bedding as long as they are dried out first. To dry out the grass clippings I dump the lawnmower bag out onto a tarp or in the back of my pickup truck to dry in the sun. Flip a few times during the day to thoroughly dry all the grass, then add to the chicken coop. Dry grass isn't super absorbent, but it is a great addition to almost any other bedding. Dry grass is compostable, should not have a ton of random seeds and it's free which is always a bonus! Dry grass breaks down well with the deep litter method. As I mentioned earlier, sand is not for anyone who's coop is in a wet area. Otherwise, using sand in the chicken coop is kind of like having a giant kitty litter box. You'll need to scoop the poop quite frequently. To do this you'll need to make a giant kitty litter scooper out of a hay rake and scoop it daily. People who use sand never really empty their whole coop out, which is probably good because it's ridiculously heavy to shovel and you can't compost sand so what would you do with it? Jess over at the 104 Homestead uses sand and loves it. I however did not have a good experience with it, which is why it's last on my list. However, I do use contractor sand in dust bathing tubs along with wood ash and DE and the chickens love it! Through the years and my experiences of trying every one of these for coop bedding, I have found that wood shavings work best for me. I prefer the deep litter method but in some of my smaller coops that's just not possible. I still like using wood shavings for those coops but I add leaves every fall since the chickens seem to love scratching in them so much. Plus, leaves are free and help to stretch the time between adding new shavings. As always, use what works best for you! What about wood pellets that folks often used for cat litter? I've never tried it (though I do get it for my cats) and I haven't heard of anyone using that, but many people use pelleted horse bedding and love it. I can't imagine it's much different. I'll have to give it a try.